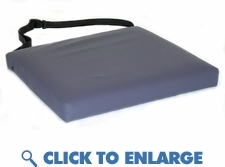 Zero Elevation Wheelchair Cushion: Designed for those at low to moderate risk of skin breakdown, this comfort cushion has a soft top layer for comfort and a firm bottom layer for support. The softly curved front edge minimizes contact with patient's thighs. ShearX all-way stretch cover reduces skin shear and is anti microbial and fluid-proof. This cushion does not add height to the wheelchair.